The Light from Light catalogue is now available in print and for viewing online. 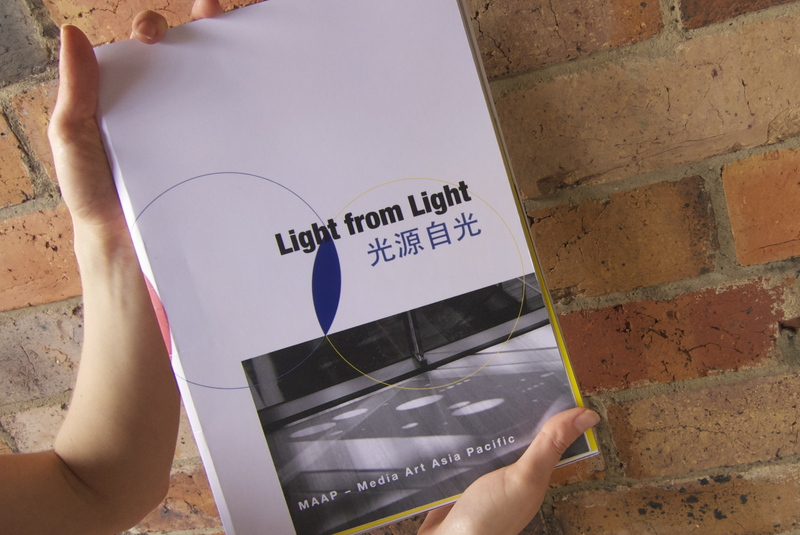 The 128-page full-colour publication traces MAAP’s major exhibition Light from Light across 5 international venues. Featuring essays by Pauline Yao (curator M+ Museum of Visual Culture, HK) and Kim Machan (Light from Light curator), with foreword by Caroline Turner (Senior Research Fellow, ANU and co-founder of APT). You can view the Light from Light catalogue online here. Alternatively, visit or contact us to purchase a print edition ($30). The catalogue was officially launched at MAAP SPACE by Lea Giles-Peters (State Library of Queensland, State Librarian, 2000-2011) on 6th December 2012. The exhibition Light from Light – REPRISE, currently showing at MAAP SPACE, presents a number of Light from Light artworks amongst documentation from the two-year touring show.